An abundance of green hills, picturesque forests and vast open spaces make it an ideal destination for walkers. After an extensive £7 million refurbishment, this 19th century country manor into the 21st century by combining chic interiors and modern comforts with the property's original character. Lose yourself in the hotel's peaceful formal gardens and 30 acres of grounds, with sweeping views of the Chess Valley. Grab your walking boots and get ready to immerse yourself in fine English countryside. 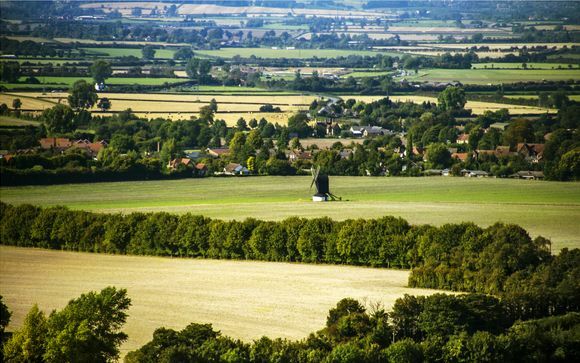 Set in the beautiful Chiltern Hills, an area of outstanding natural beauty, De Vere Latimer Estate offers the perfect base from which to explore and discover this spectacular National Park on foot. The region’s sloping hills and ancient woodlands has long attracted walkers and ramblers with its promise of epic landscapes and incredible wildlife. From family home to military base, this regal 19th century country house certainly has a story to tell. Today, it has been transformed into a chic space that blends bold, modern styles with its elegant original characteristics, creating a sophisticated place to relax after exploring all that Buckingham has to offer. All this is set within peaceful formal gardens and surrounded by 30 acres of grounds, with sweeping views of the Chess Valley. The hotel's recent refurbishment has endowed each room with a cool, chic design where contempory style and comfort reigns supreme. - Single Guest Room (8m² / max. 1 person): Unwind in the subtle elegance of your room where lots of comfort is packed into a small space. - Double Guest Room (17m² / max. 2 persons): Thoughtfully furnished, these classic en-suite rooms feature modern amenities that make it the ideal base for your holiday. These rooms are situated in the Cormorant or Mews buildings, not within the Mansion House. - Junior Double Room (8m² / max. 1 person): Fully refurbished, these rooms combine Victorian architecture with contemporary style. - Superior Twin / Double Room (12m² / max. 2 persons): Each carefully designed room features stylish artwork that allude to Buckinghamshire's thriving wildlife. - Superior Double Room with a View (12m² / max. 2 persons): These rooms have all the charms of a Superior Room with the added bonus of excellent views of the hotel's rolling estate. - Deluxe Double Room (21m² / max. 2 persons): Located in the historic mansion house, all Deluxe rooms feature free Wi-Fi and come complete with king size beds, fluffy robes and slippers, while some also benefit from stunning views. - Suite (21m² / max. 2 persons): Located in the historic mansion house, each suite plays host to stunning views over the Chiltern Hills that will take your breath away. A highlight of the hotel's extensive refurbishment is it's new restaurant, bar and outdoor courtyard, where you’ll discover locally-sourced, seasonally-inspired menus served in a dining room where light streams in from its glass ceiling. For extra romantic moments, guests can enjoy their dinner on the hotel's patio where sparkling fairy lights are nestled within the tree canopy above you. 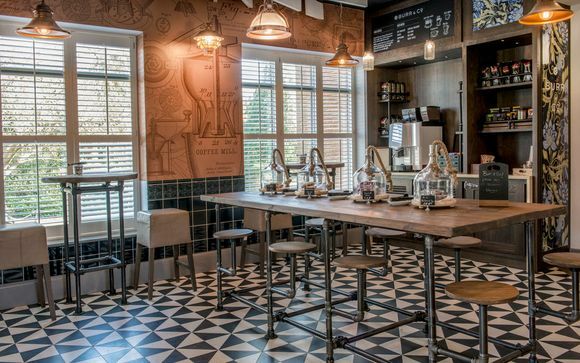 Meanwhile the hotel also has a new artisan coffee shop Burr & Co. where the fresh aroma of coffee draws guests in for quick stops and laid back afternoons alike. Your hotel is approximately 5min / 2.5km from Chalfont & Latimer Station. Free parking parking is available.